A bicycle lock is essential for every bicycle owner. If you want to protect your means of transportation, no other investment will get you more bang for your buck. Thankfully, you can secure your bike without spending an absurd amount of money. Bicycle lock designs have undergone a recent evolution, which has made them both more secure and affordable. If you’re ready to ease your mind when storing your bike in a public area, the time to invest in a quality bicycle lock is now. Without the proper experience and know-how, it can be hard to decide on the best bicycle lock. Thankfully, we have taken this burden upon ourselves for your convenience. By researching every aspect of bicycle lock design, we have determined the five best products on the market. To ensure we have made quality choices, we have checked out both professional and expert cyclist opinion, manufacturer’s details, and more to create an informed article for our readers. Check out our expert & beginner cycling buyer’s guide and product reviews below to ensure you invest in the product that will best suit your individual needs. The Kryptonite KryptoLok Series 2 U-Lock is a fantastic mid-range model that allows cyclists to get the security of the trusted Kryptonite brand without breaking their budget. If you want to ensure your bike will stay safe, this is a great choice. The Kryptonite KryptoLok Series 2 U-Lock features a bent foot design that guarantees it is hard to break or remove from a bicycle. Additionally, is disc-style cylinder design is drill resistant and extremely resistant to lockpicks. Due to its Transit FlexFrame Bracket, the Kryptonite KryptoLok Series 2 U-Lock mounting the product is simple. No matter where you are storing your bike, this feature will help you easily secure your possession. Lastly, the 4-foot flex cable that comes with the Kryptonite KryptoLok Series 2 U-Lock adds extra protection. After you wrap the cord around your bike and the storage area, your cycle will be tightly secured. Few locks in this price range offer as many features and safety considerations than the Kryptonite KryptoLok Series 2 U-Lock. Want to stop worrying about your bike every time you leave it outside of a building in the city? Fahgettaboudit with the amazing Kryptonite New York Fahgettaboudit Mini Heavy Duty Bicycle U Lock Bike Lock. Thanks to a sturdy construction and a nearly solid design, your bike will be practically steal-proof. The high-performance steel used in the Kryptonite New York Fahgettaboudit Mini Heavy Duty Bicycle U Lock Bike Lock construction makes it extremely durable. If you want a lock that will last through years of wear and tear, this is the product you’ve been looking since. With its double deadbolt locking system, the Kryptonite New York Fahgettaboudit Mini Heavy Duty Bicycle U Lock Bike Lock is nearly impossible to crack with tools. If you have fallen victim to theft in the past, this lock will quickly put a stop to it. 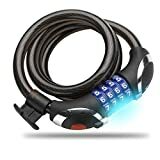 For those who ride around at night, the high-intensity bulb built into the Kryptonite New York Fahgettaboudit Mini Heavy Duty Bicycle U Lock Bike Lock will be very attractive. You will never have to fiddle around in the dark again thanks to this awesome feature. A slightly bulkier and stronger version of the product above, the Kryptonite New York Fahgettaboudit U-Loc might just be the best bicycle lock on our list. Additionally, it features the maximum security rating possible for a bicycle lock, making it perfect for the cyclist with high-end bicycles they need to protect. Unlike the previous Fahgettaboudit U-Loc offering, this model comes with a stylish, heavy-duty six-sided chain link. If you want extra security for your bike, this feature will secure your transportation to any storage area. It is made from hardened manganese steel, which makes it nearly indestructible. When you’re not using the Kryptonite New York Fahgettaboudit U-Loc, you can keep it safe in its stylish protective nylon cover. Ultimately, no other bicycle lock brand on the market can top the design sense of Kryptonite. Finally, the Hook-n-Loop fasteners make the Kryptonite New York Fahgettaboudit U-Loc simple to use. For those who rush around town every day, this feature should prove particularly useful. The Etronic Security Lock M8 Self Coiling Resettable Combination Cable Lock is the most affordable bicycle lock on our list, making it perfect for those who need simple and accessible protection for their bicycle. If you don’t need the powerful security features of a Kryptonite lock, this is the product that will best suit your needs. Just because it is more affordable, that does not mean it fails to provide quality safety features. 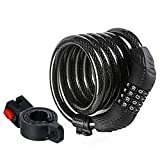 In fact, the 5-pin cylinder lock of the Etronic Security Lock M8 Self Coiling Resettable Combination Cable Lock gives it a ton of pick resistance. Additionally, the high performance, braided-steel cable material makes it easy to secure your bike to any area. 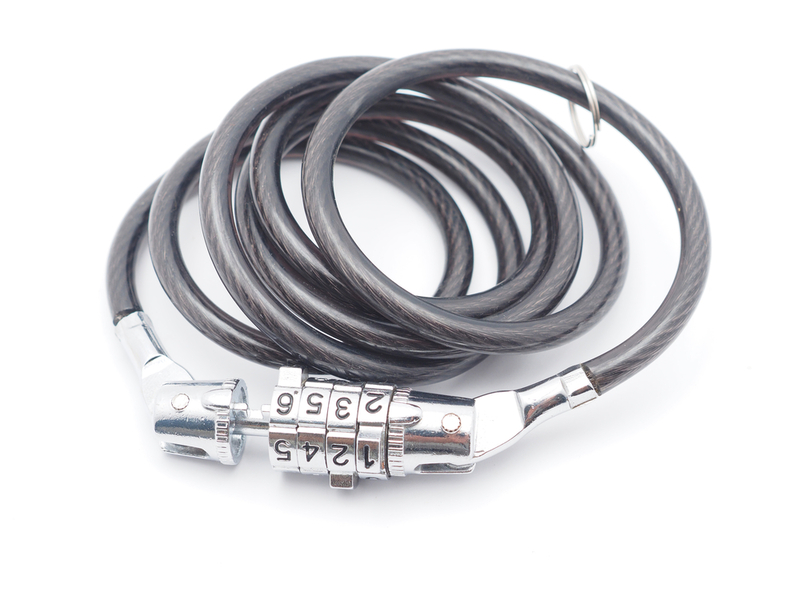 The Etronic Security Lock M8 Self Coiling Resettable Combination Cable Lock comes with two keys, which is great for consumers who share their bike with others. It also comes with a mounting bracket, which furthers your ability to secure conveniently and store your bike, no matter where you are. Finally, the protective vinyl coating of the Etronic Security Lock M8 Self Coiling Resettable Combination Cable Lock keeps it from experiencing unsightly wear and tear. This model is sure to last you for years if you treat it right. Another affordable bicycle lock option, the Xtreme Bright Illumilock Cable Bike Lock features a simplified design that any user can understand. Being both easy to install and use, you will never have to stumble before class due to poor lock design again after investing in this fantastic product. To help keep you safe on the road and on, the Xtreme Bright Illumilock Cable Bike Lock comes with an LED light that serves as either a headlight or taillight. Visibility is safety, and Xtreme Bright aims to keep all of their bikers safe and sound at all times. For the price tag, the quality of the military grade steel material the Xtreme Bright Illumilock Cable Bike Lock is constructed of is highly impressive. It is waterproof, shock resistant, and all around durable. If you’ve had issues with faulty lock design in the past, this amazing lock is here to blow your mind. Lastly, the design of the Xtreme Bright Illumilock Cable Bike Lock extends past pure usability. Due to its ergonomic design, it will fit any bike model. It seems to go without saying. However, many people will just assume any lock on the market will protect their suitable bike. Unfortunately, thieves have figured out how to break many of the most standard locks. If you want to ensure your bicycle stays safe after it’s parked, you need to invest in one of the quality bike products on our list. Even our more affordable models feature high-security ratings and have specific characteristics built-in to prevent theft. If you fail to invest in a quality lock, you will be paying a lot more in the long run, so do yourself a favor and spend intelligently. Before finalizing your decision on a bicycle lock, you should carefully consider these six important product qualities. Each one of these elements will help you make an informed and smart decision, leading you to a great investment. Bike thieves know there way around low-end bicycle locks. With this in mind, you need a lock that has put considerable thought into how it prevents thieves from picking a lock or breaking a chain. Thankfully, the products on our list all provide resistance features that keep your bike safe and sound. In fact, most of them are completely pick-resistant and are made from a high-grade material that is nearly indestructible. Beyond locking your bike up against a rack or pole, mounting brackets unlock a lot of flexibility for cyclists. If you want to store your bike anywhere and everywhere, a mounting bracket opens a whole new level of convenience. While every product on our list does not provide this useful feature, those that do have received some major points for its inclusion. If you ride your bicycle at night, you know how frustrating dealing with a lock in a low-light environment can be. It is not only frustrating, however, but it can also put you in a vulnerable and unsafe scenario. To help keep you safe, many bicycle lock manufacturers have begun putting built-in lights onto their products. Most of these are LED and provide a soft, but bright light that will help you get on the go quickly and safely. Just wrap the cord or cable around the cycle and the storage area, and you’ve made it that much harder for someone to steal your good bike. Most of these products are made from high-grade steel of some sort, making them tough to break. Even if your bicycle lock is excellent in every other area, a lack of strength will make it a poor investment. You want a product that will last for many years, so investing in an extremely durable lock is essential. Beyond having strong steel or other materials, it’s important to grab a lock that features other durability characteristics, such as having a waterproof design. Shock absorption can also be useful, as it adds an extra level of security to your lock while simultaneously helping it to be more durable. Nobody wants to fidget with their bicycle lock for minutes at a time every time they go to store their bike. With this in mind, you need to pay close attention to user ratings regarding how easy a lock is to use. Thankfully, manufacturers have placed an enormous emphasis on usability in recent product designs. In our list, mainly, you can feel assured that the products are both easy to use and install. Especially for users with expensive bicycle models, it’s always important to prepare for the worst. Bicycle insurance is relatively inexpensive and will keep you from being up to the river in the case of theft. While it may be frustrating feeling out the initial forms and getting started, nobody likes to have to adjust to the whims of thieves, after all, it will be well worth the effort and investment in the long run. For an affordable way to ensure your bicycle, check out the plans at Bike Register. Thieves strike at all times of the day. However, they are more partial to poorly lit areas. If you park your bike on a dark street corner in the middle of the night, it becomes a prime target for a thief. Try to scope out an area that has as much visibility as possible. It does not only mean light but some spectators around as well. If you have a quality lock, a thief will have to use strong and visible power tools to stand even a chance of getting on your bike. By parking in a high-traffic or guarded area, you eliminate their ability to use those tools without getting caught. The Metropolitan Police Service has put in place a “Three R’s” system to help keep cyclists’ property more secure. By following these tactics, you will drastically increase your chances of keeping your bike safe from thieves. You need to maintain a record of your frame number, and any other potential markers that can be used to identify your bike. In the case that your bike gets stolen, this is the information that will help the police recover it. Taking photos of these numbers, markers, and your bike as a whole is also important. If you fail to register your bike, it will be extremely hard for the police to recover your property efficiently. To ensure you are prepared, go biking Register.com now and get your bike properly registered. In the unfortunate case that your bike is indeed stolen, you will be glad that you did. As police technology and bike, tracking becomes more advanced. Bikes returned to their users after stolen. With this in mind, it is important that you report your bike as missing to the police as soon as you realize its missing. Even if you are not sure stolen yet, this preemptive action can help you increase your chances of recovering your bicycle in the long run. Whether it be stickers or paint, customizing the look of your bike in some way is essential to keeping readily identifiable in the case of theft. The durable chain and nearly indestructible lock construction keep your bike securely fastened, no matter where you’re riding. If you want to erase any thoughts of possible bike theft, this is the product that will get you the most bang for your buck. If you are only looking for a quality bicycle lock that will not break your budget, however, the Xtreme Bright Illumilock Cable Bike Lock provides an excellent choice. Its design is simplified to not only make it easy to use and install but to make it fit any bicycle model without fail. Additionally, you do not sacrifice durability by paying less, as its military-grade steel material is waterproof, shock resistant, and able to last for years with little to no visible wear and tear.